Boston homeless and their supporters at City Hall. Boston — People with little or no money are usually mischaracterized by the liberal corporate media as a pitiful lot, “down on their luck,” requiring the charity of the more fortunate. 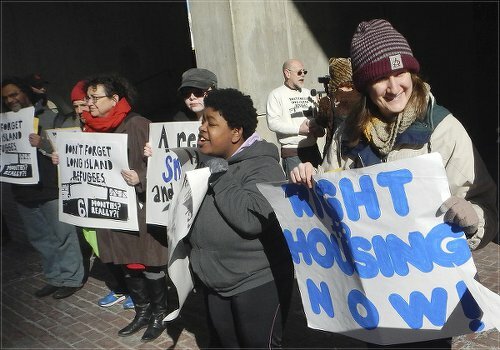 These false and self-serving notions were overturned on April 8 when a contingent of homeless people and their supporters held a sit-in at the office of Boston Mayor Martin Walsh. It was the six-month anniversary of the what is known as the “Boston Shelter Disaster,” when 750 homeless people and those in recovery from addiction were forced out of the city’s biggest shelter, the Long Island shelter in Boston Harbor. With but four hours to prepare, people were bused off the island after it was determined that the one bridge leading there was unsafe. Although for years the bridge had been known to be a disaster waiting to happen, the entire operation was conducted with no planning or after-care provisions. Some 60 recovering addicts were removed — in the middle of detox — from the state’s largest such facility. Some 450 homeless people were forced into already overcrowded shelters or on to the street. Safe Harbors, the only shelter dedicated to people with HIV, has been shuttered. Its few remaining residents are segregated in a general population shelter — in a separate room without confidentiality. At least eight out of 19 HIV-positive people have subsequently relapsed, and are on the street, according to Boston Healthcare for the Homeless. The Boston Homeless Solidarity Committee, initiated by ACT-UP Boston, took up a vigorous organizing drive after the disaster. 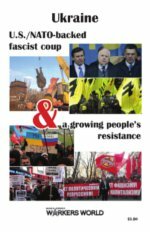 It reached out to people in shelters and recovery programs and recruited them into the leadership of the fightback struggle. 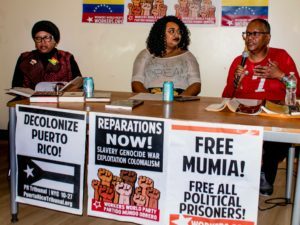 At the opening press conference on April 8, Liza Green, representing the Women’s Fightback Network, issued a call to organize a People’s Tribunal to put the city and the shelter system on trial. When the BHSC group sat in Walsh’s office, he refused to meet with them, even though he was in an adjacent room at that very moment conferring with staff and City Council members. Rather than be confronted by the homeless solidarity group, the entire assemblage left their meeting through a backdoor. Massachusetts, despite its liberal national image, has the fastest-growing homeless population of any state. (Boston Globe, Aug. 30, 2014) The official estimate counts 26,000 homeless people, many thousands of whom are single parents and their children living in dozens of motels for the homeless scattered across the state. These shabby motels and unsanitary shelters are part of a minimum-security incarceration system. Homeless people must bid every day at 2 p.m. to secure a bed for the evening, and they have only small lockers in which to keep their few belongings. That makes it effectively impossible for them to work. Their undiagnosed and untreated medical conditions are the product of intentional neglect and oppression by the capitalist system. Shelter staff are in effect prison guards. According to many residents, anyone who challenges authority can be removed without due process and put on the street. Karl Marx, in Chapter 5 of his groundbreaking analysis, “Capital,” described such workers as the “reserve army of the unemployed” — the section of the working class who are kept permanently unemployed under capitalism, potentially to be used to break strikes. 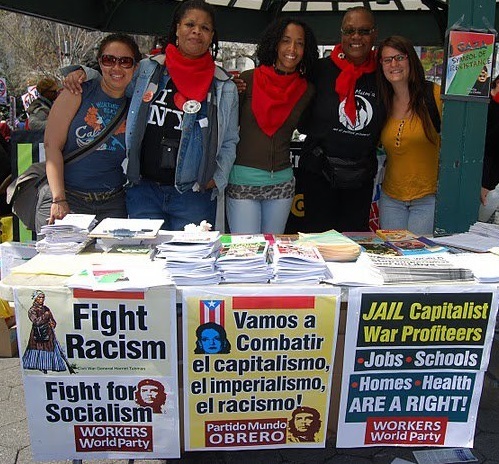 These masses, in Boston and everywhere, are so oppressed they are not even available for wage exploitation — not even at low-wage jobs. Since they cannot create profit or surplus value for employers, they are viewed as having no value whatsoever by the capitalist system. But the homeless in Boston are organizing to fight back and survive. Their contribution to the class struggle is invaluable. The corporate rulers of Boston are under attack. 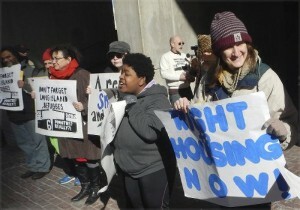 The Boston Homeless Solidarity Committee will hold a protest march and rally on April 23, originating at the Woods-Mullen Shelter and the emergency Barbara McGuiness House, where many of the 45 women there are forced to sleep on dirty mats in the cafeteria. For more information, contact [email protected], 617-721-5347.